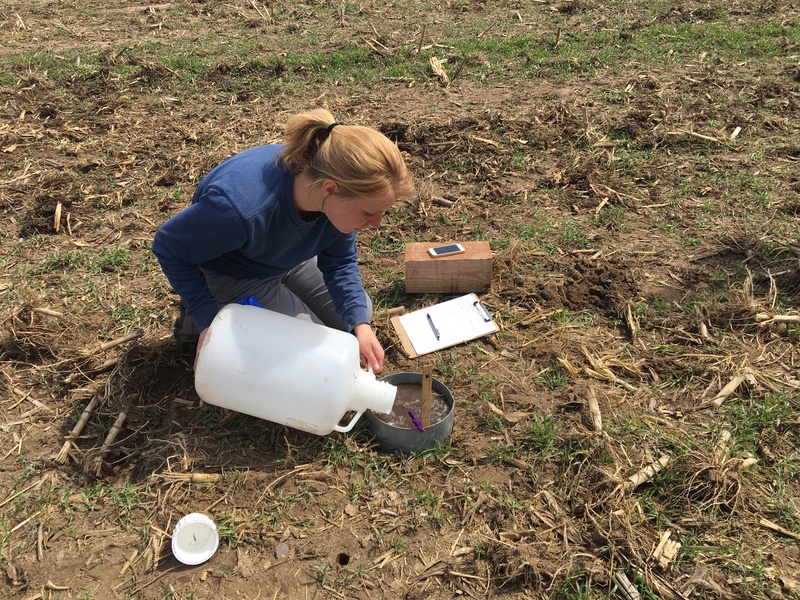 As part of Discovery Farm’s Nitrogen Use Efficiency (NUE) and Tile Drainage Projects, staff has been busy in the fields the last few weeks collecting soil health samples and measurements. Discovery Farms included a soil health piece into these projects because of the lack of research on how soil health measures relate to NUE and tile water quality. Soil health combines the chemical, biological, and physical properties of a soil system. In 2015, 2016, and 2017, Discovery Farms included biological soil health measurements including Potentially Mineralizable Nitrogen, Potentially Mineralizable Carbon, and Permanganate Oxidizable Carbon into soil sample analysis (See Digging deeper into soil health) and will continue in 2018. This spring, Discovery Farms is also collecting physical soil health measurements. At each NUE and Tile monitoring site, samples were taken to measure the dry aggregate fractions and water stable aggregates of the soil. (Defined below) At 10 sites, as part of an in depth case study of management practices, a more rigorous evaluation of physical soil health was performed. Evaluations at case study fields included the dry aggregate fraction, water stable aggregates, infiltration rates, and water holding capacity. Dry aggregate fractions: The percentage of aggregates at various sizes (large clods to dust size). Water stable aggregates: How stable smaller sized aggregates are when disturbed. For our analysis, we simulate rainfall to determine how well the aggregates remain stable, rather than break apart. Small aggregates are important for carbon and water storage, as well as various other soil health parameters. Infiltration rate: The rate at which water percolates into the soil. Good infiltration ensures water enters into the soil for crops to use as well as keeps water from running off the surface of the field. Watch the following videos for a better look at Discovery Farms soil health field work.